Toddler Approved! : Magazine Challenge: Game Time! I am excited to be participating with 20+ bloggers today in TinkerLab's Creative Challenge using magazines! The challenge was to use magazines to create! We hunted through our house to find some magazines... and only found 2-3, but that was plenty for this project! Since this is a child-directed challenge, we started exploring the magazines and I kinda just waited to see what my little guy came up with. The only materials we had out were tape and magazines... though I kept the craft cupboard open to let him explore and have easy access to other tools. We ripped our favorite pages out and made a big pile. After checking out ads and talking about things we saw that would be fun Christmas presents (or things that we thought were funny), it was the baby that gave my son his inspiration! She started grabbing the magazines and scrunching them up. After a minute or two of getting mad at her for messing up his pictures he exclaimed, "We should make magazine balls to play with!" I obliged and asked him if we needed any other tools to help us. He looked at me like I wasn't smart and said, "we need tape" (I was expecting him to say "duh!" with the look he gave me). We scrunched and taped... and taped... until we had a little group of balls. I waited to see if he had any other ideas.... and after a few minutes of hitting the balls around he decided we needed hockey sticks too. We put the baby down for her nap (since she kept trying to eat the magazine balls) and sat side by side on the floor rolling and taping magazine pieces. It was so fun to work together on such an open ended project. It was also kind of exciting that I didn't have any idea what our end result would be... though I should've known... since my little guy is all about sports and moving and balls! Once we had each created a hockey stick, he said we were ready to play! After we used the hockey sticks for awhile, he decided we need bowling pins too. We rolled up the magazines and went around and around them with tape and then snipped off the bottoms to make them flat (so they would stand up). I think from now on I am going to keep tape and a magazine in my purse. Now I know that if we are really in a bind and are stuck somewhere (like waiting at the doctor's office forever)... all we need is some tape and a magazine and we will be entertained for HOURS. Simple projects like this always end up as favorites. Leave it to my son to figure out how we could make hockey sticks and bowling pins out of magazines. So funny! In addition to having a great time, we also sneakily worked on learning a few things: new vocabulary words, describing pictures and adding more detail, identifying letters and words that we knew in the magazines, and counting (number of pieces of tape we used, number of balls we created, number of pictures of Elmo that we saw, etc.). Thanks for organizing and hosting this challenge Rachelle! I am so excited to be participating with all of these other wonderful bloggers. Head on over and check out their creations too! 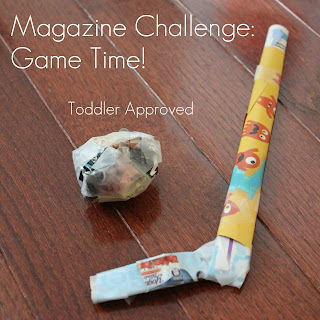 What would you (and your kids) make with a magazine? If you have a magazine post to share, link up! Wow! What fun! And super duper creative. I LOVE IT!!!! What a great child centered project. I didn't allow my children to take that much responsibility. Maybe I should have. I love what he came up with and the progression of how he came up with it. This just shows that we don't have to make things more complicated than they are! I love how you put your son's ideas on center stage. We did something similar and my daughter came up with a sculpture -- isn't it fascinating to see their personalities ring through projects like this? And I agree with Amy about the tape -- bulk rolls of tape for us all the way! FANTASTIC!! This post is a perfect example of letting the kids lead. I LOVE, LOVE, LOVE IT! Sweet idea! Looks like you had a lot of fun! My daughter would love the idea of making art and creating it into a physical activity! What a playful idea. Brilliant and fun! I love this idea, so much fun. And a great physical activity for days when it is too wet to spend much time outdoors. You and your kids are always an inspiration to us! Thank you for sharing your wonderful ideas. By the way, we LOVE your son's Thomas Pj's!!!! Juanma (my little guy) is a Thomas fan too. such a cool idea - I'm going to try this with my kiddos for sure! Thanks. LOVE the newspaper hockey creations - what FUN!! You are so creative!